I may also be getting some new Zentreadi models but not sure how they will look as they were specifically made for Space Empires IV (By Atrocities...). He says they are low poly but the pics look fantastic so I am hopeful they can BOTH be converted over and still look good after the transition. Anyway I am hoping to make a TC for that same game and did a test for The Invid Race. Here is the result. You see the Unit(s) that were built and their tiny combat Icon. 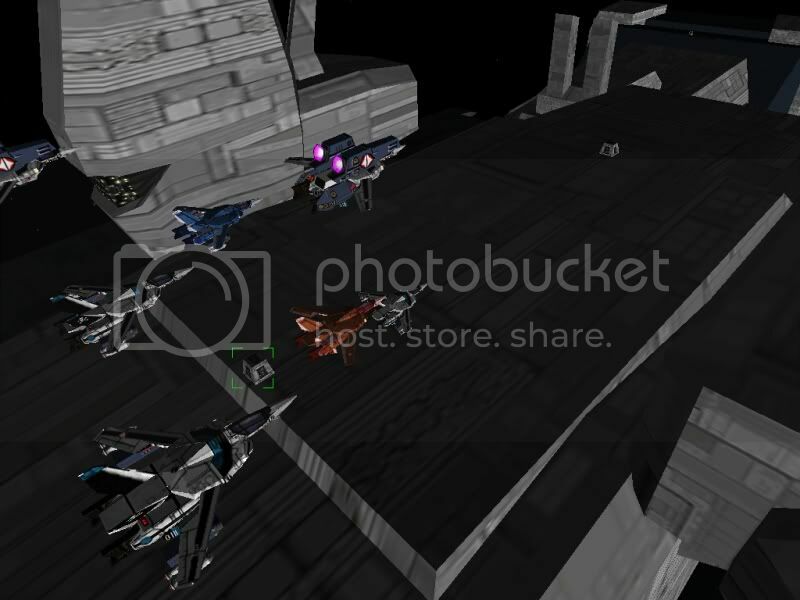 Ignore the fighter group pic, the original entry was fro a Zent pod so when more than 1 is displayed a group pic is shown of all fighters and I did not make a pic of all types of Invid (YET) so the defualt pic got used.. I hope you guys like this RTS idea. AFAIK the only complete robotech RTS mod is a Starcraft one (it's all sprites and I don't even have SC lol) and a defunct Armada II mod. I don't count the Homeworld one cause that is more of fleet battles and NOT empire building. 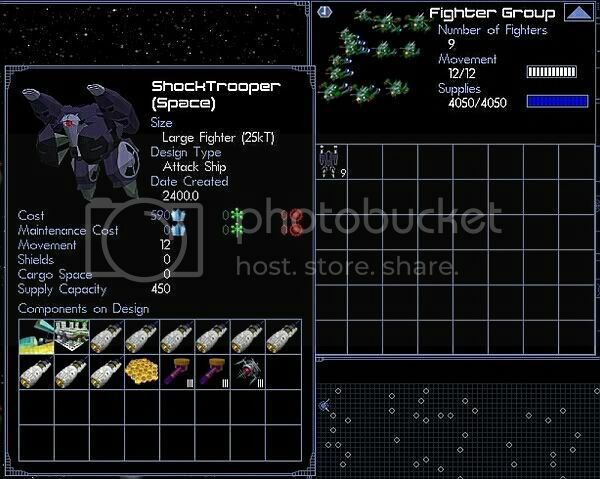 Space EmpiresIV is VERY much like my favorite RTS game of all time "Birth of the Federation"! However SE4 does not use actual 3d models, just images of them. I even found the Vasudans had been converted but so far I haven't found our Terrans. He he. having a ball making DVD screens or finding good ones on net. Later I will go back and replace them with suitible meshes in poses. I got permission from Atrocities to use his Zentreadi mod and my first step when it comes to modding them will be a simple facelift for SOME of the images (as many of his existing pics are awesome! In fact I asked about getting a hold of the models the HE specifically made to make those images with!!!). If I can get those then even if they MIGHT need a few more poly's added on or a retexture, they still would fill a LOT of the gaps in the Zentreadi shiplist for the FS2 mod. I just started the RDF/REF side of the SE4mod. Once all images have been assigned I will then make sure everything works according to defualt tech and then go back and start working on custom tech for each race... Nothing etched in stone as far as that is concerned yet, but I've had soem ideas. Oh yeah I totally forgot about the Robotech masters! Guess that mean it will be a 4-way for TC. Or later people can just load them on one race at a time as single add on mods. I found some of AA's work on Battleclinic (A SFC site). I remember long ago he tried to convert some stuff over... Didn't see the Ikazuchi there? Anyway as long as all the meshes are his should be no prob, but I will be asking around there for clarification. I saw these models few weeks ago but i found the map rendering not really good. Maybe it could be better with the FS2_open engine. "Something is better than Nothing..."
Got some good news/bad news. I am legally not able to drive anymore due to double cataracts (at the age of 35) so I'm a little angry about how things are at the moment (including having to be about 6 inches from the screen to read this and corect typos). Don't mean to vent but I nearly lost it in the Doc's office a few weeks ago and it's been a roller coaster since then. (Can I pay for the surgeries? Will my work get my paperwork in or reject my application for insurance? Can I keep my job long enough to be covered?) these kinds of things have been on my mind lately, ect... So my apologies if I've been uncharacteristic lately in postings or replys (like being short with people). I've decided if things go, bad... Then when the time comes, upload everything I have on hand for the mod in the hope that in the future someone revists it and ressurects it (if it comes to that). Of course I won't upload the vocie parts (it's like 1 gig after all), but in regards to the mehses, textures, missions ect... So they have a framework to build on. Let's hope that does not become necessary. For the mod, I will continue: I don't know if I would make a campagne or only a serial of missions, it would depend of my time. At the moment, I'm using voices from Max Sterling. I should receive the Macross Island modelized. I don't know yet, how integrate it in the game. As for the isle, I was going to wait to see how StarFox does things in regards to ground... What they've done with landscapes (buildings and even lighted streetlamps) are great! I'm trying to stay fopcused for now and just keep modding what I can. Trashman will be sending me a version of Storm Attacker soon so I can make some tests in regards to that boldoza fortress. If it would be alright with you could you send me those new battle pods you made as well as the boosted officer pod? 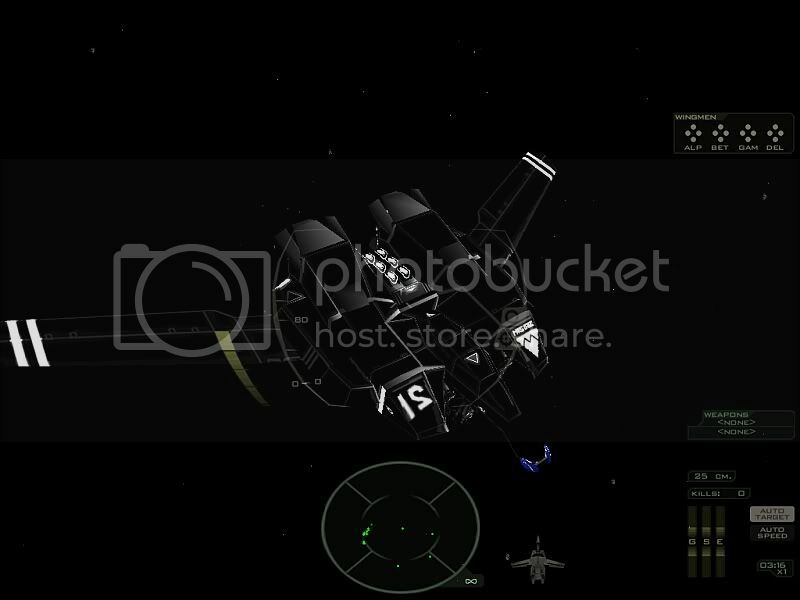 The two cruisers just smaller than the flagship for Zents also I need (Khyron's ship and that monitor next to it). It would be a HUGE help. IT was always my gripe that if shields exist they SHOULD block weapons (unless specially designed to bypass, ala transphasic torps), However each attack drains the shield at diff rates so EVENTUALLY it goes down. Probably with a LONG recharge time if it was brought completely to zero! Ok thanks for your informations, i just must use the last FS2_Open: the one than I used for testing was too old to include this function. Which version are you using?? I am using 3.6 - any newer and I get multi table errors that I can't figure out (all ships show an error). When I am finished building I will let others more knowledgeable about SCP convert it all over. I don't have any error with my tables, you takes the good weapons in my weapon table? I'm currently using FRED2_Open3.6.5 (later versions crash down when you display the model), or you can use all last Fred2_open releases but without displaying the model (mapped or wireframe= crash). You will see, than there are mapping bugs with the Quedol Magdomilla: no bugs with the original model but after the conversion in *.pof. I haven't even got to weapon errors (yet) I mean literally every ship entry even from stock fs2 (all vasudans, all Terrans, adn all shivans) have gun mount errors? (never heard of that before) and many other "token missing" stuff I have no idea what the SCP did to 3.7/8?, but my tables work no problem at all in 3.6.. maybe it's clashing with mods I don't know. At this point as long as I can continue modding I will use whatever version functions for me with no (or minimal) errors. Lately the most frustrating thing I have to deal with is multi-textures until I can get them baked down to less maps (ie Like a Valdore with 18 textures for the Trek mod). Show up in FRED fine, but crashes in game. I've solved all "token missing" errors in my tables. The only ship which is crashing under Fred2_Open3.6.5 is the Regult (don't know why) but run correctly with all later releases. But no errors in-game. The number of textures by ship is a problem, that's why i'm using always the same. I have converted all big maps in *.dds to accelerate the game.